APA! issued a press release in August 2008 about a puppy that was brought into our care. An abbreviated version is included here. KVUE news also ran a story about it, which you can watch or read at http://www.austinpetsalive.org/news. We included information for those who wanted to help the puppy, keep up with his progress, and potentially adopt him. "An 8 week old male schnauzer mix was the latest victim in a domestic violence dispute. He paid the price for his owner’s irate boyfriend, when the man broke into his girlfriend’s house and took his aggressions out on her puppy. After he forced the puppy to drink dish soap, the dog was eventually rushed to the vet where his stomach was pumped, and he was treated for gastric and esophageal ulcerations. Last Friday, the boyfriend returned again, and was believed to have kicked the puppy or slammed him against the wall. The dog suffered brain trauma and was not able to stand, see, or eat. He also suffered other serious traumas, including a rupture of his lungs that made it difficult for him to breath. The woman turned to Wildlife Rescue and Rehabilitation (WRR) in Kendalia for help and to keep him safe. 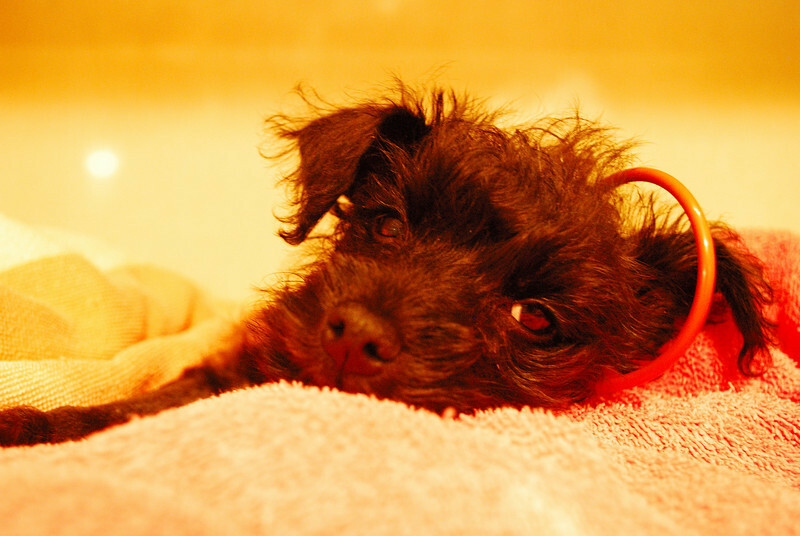 WRR immediately took the puppy to an emergency hospital in San Antonio where miraculously the puppy began to improve and was then transferred to Austin Pets Alive! for continued care. He will need supportive care to give him the nutrition and pain medicine he needs while he recovers. Today he stood for the first time for a few seconds, but he is still in grave danger because of the lung rupture. While he stabilizes, surgery on his lung lobe is being discussed but could cost thousands of dollars. Austin Pets Alive! is asking for donations for the considerable vet bills. Ellen Jefferson, Executive Director of Austin Pets Alive! says their organization is committed to finding him a good loving home once he is stable. For more information about legal proceedings against the individual who did this, please contact Executive Director Lynn Cuny at Wildlife Rescue and Rehabilitation at 830 336-3636."